1) This song is about a woman waiting impatiently for a phone call. Do you consider yourself patient? I do when I am at work. I am very patient with kids, but if I am waiting for a medical issue to resolve...yeah, not so patient. I struggle. 2) Other women (most notably Shirley Bassey and Dottie West) have recorded this song. Harry James and Doc Severinson did instrumental versions. But there's no record of a male singing "Oh dear God! It must be her! Or I shall die!" Do you think that's because waiting for the phone to ring is more "a chick thing," and men simply don't do it? I think men just don't like to talk about it like girls do. I think they do wait for the phone to ring. 3) This recording enjoyed a sudden surge of popularity after 20 years when it was included on the soundtrack of Moonstruck, the 1987 film that won Cher an Oscar. Have you seen Moonstruck? I don't know if I have or not. I do not remember it. 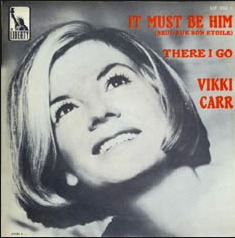 4) This week's featured artist, Vikki Carr, was born in El Paso, TX. El Paso can proudly proclaim itself one of America's safest cities. What can your hometown be proud of? I lived in a town with a rich football history and I teach there now...home of the WOLVES! We are also known for the beautiful Table Rock Lake and also Silver Dollar City. It is also close to Branson. 5) She was a staple on Jerry Lewis' Labor Day Telethon, raising funds for the Muscular Dystrophy Association by performing this song. Is your TV on right now? If so, what are you watching? no, it is off for the night. I am answering these questions and heading to bed. 6) In 1971, Vikki fulfilled a dream of hers by establishing the Vikki Carr Scholarship Foundation. Every year the foundation awards Hispanic American students money to use toward higher education. She says it's her way of returning "the support and encouragement she received from others" early in her career. If you could establish a charitable foundation, what cause would you like it to benefit? I think I would like to help out mental health patients. I learned over the summer it is so much easier to treat a physical ailment, but mental health is not very easy to fix and insurance does not cover as well. I would want to make sure people who need help could get it. 7) In 1967, when this song was popular, Dr. Christiaan Barnard performed the first heart transplant. Today, one of the most common surgeries performed in the United States is the coronary artery bypass surgery. Have you had any surgeries? I had a c-section when my son was born, I had my tonsils and adenoids out as a child in 1st grade and I had gall bladder surgery 2 years ago. I also had my wisdom teeth out in my 20's. 8) Also in 1967, the RMS Queen Mary was retired after 31 years of service. Have you ever traveled by cruise ship? no, I haven't, but I think I would like it. We usually just drive where we are going and visit. 9) Random question: Who is your oldest living relative? My Uncle Joe...my dad's brother, he is 79 years old. Your answer to #6 is inspiring. I love your answer about who to help. You're correct in your assessment of the situation about mental health. Very keen of you to notice. Moonstruck is a really fun movie, especially if you are Italian. I enjoyed your S9 answers!! I'd be right there helping with mental health issues...and I think we could tie it in with the dementia, too! I've not cruised yet, either, but we're planning to go on a 9-day one next summer. I'll let you know what I think. Well, you live in a wonderful area. We absolutely love going to Branson and always go at least once a year. We usually stay at The Keeter Center at the College of the Ozarks, such an awesome place. Liked your answer, such a great cause. Happy weekend! That's a great goal for being a wealthy tycoon. Mental Illness sometimes masks a physical illness, also. They should get over themselves and cover it. We really have a backward idea of taking care of "the People". Have a lovely weekend.. and hope it's restful, too. Both of my kids had their wisdom teeth out in their 20's. I am still holding on to mine though.